“Before you judge me, try hard to love me. When the Avengers opened May 4th, few people would have expected the recording breaking success that followed. It is a movie that breaks many bounds both in scope and achievement. It has set the new standard for movies in general and super hero moves specifically. But what would the Avengers be without their villain? Loki. So much is made of the Avengers themselves; Captain America the ultimate good guy/patriot; Thor, the golden god; Iron Man the captain of snark and impossible tech; Hulk, need I say more; Black Widow of the ledger rouge and Hawkeye who trumps them all with his quiet badassery. They would all just be loose ends floating around in their separate little universes of do-goodery if not for one particularly intelligent and mischievous deity. 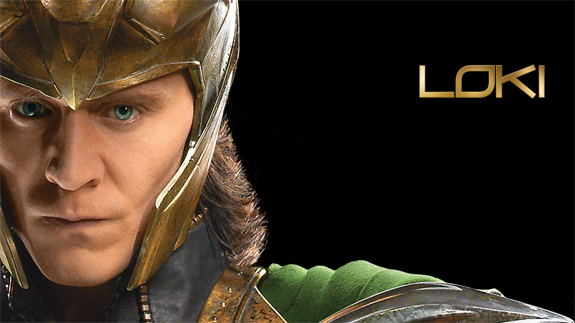 What makes Loki such a compelling villain? What makes Loki so compelling, not just as a villain but as a character are his motivations. He is not evil for the sake of being evil, which is all too common among lesser villains in other storylines and a major failing of many, many writers. Fortunately this was not the case or I am quite certain Avengers would have been mediocre at best, pathetic at worst. Loki’s motivations are grounded in his upbringing. He was raised to be a ruler, a leader, someone others could look to for guidance and protection. Odin even tells him in Thor (2011) that he was born to rule. As a child of Laufey, the defeated monarch of the Jotunheim, he was a captive prince even if he was adopted as the son of Odin. If he had not been left to die as an infant by Laufey and found by Odin he would have been rightful ruler of the Jotunheim. Had he been older than Thor he might even have been first in line for the throne of Asgard. However, as with most patriarchal societies the eldest, regardless of ability, inherits. But how does this bear on him becoming the antagonist in Thor and Avengers? He is the anti-hero, the one who does what others won’t in order to achieve goals that must be met. “In literature and film, an anti-hero is a central or supporting character that has some of the personality flaws and ultimate fortune traditionally assigned to villains, but nonetheless also have enough heroic qualities or intentions to gain the sympathy of readers. Anti-heroes . . . are always in some fundamental way, flawed or failed heroes.” (www.library.spscc.ctc.edu/electronicreserve/swanson/AntiheroDefinitionWinter2004.pdf) Loki knew in Thor that his brother was not ready even when everyone else was eager to enthrone the golden god. He resorted to clandestine means to show this fact to his father. It worked. Thor got a much needed lesson in humility, but Loki was left to suffer far graver consequences. Thor’s penchant for violence not only got Fandral injured it damaged Loki in far graver ways. His learning of his true heritage in such an abrupt manner would have thrown anyone for a loop. Then add in the fact that all he’s ever been taught is that his kind are monsters to be slaughtered on sight and the ante for self-hatred goes up several notches. What sort of emotions would have gone through your mind as you confronted the man you’d learned was never your father? His anger, frustration and hurt are easily observed in the weapons vault scene. (http://www.youtube.com/watch?v=cgKX2F4qr7w) How many of us have ever felt betrayed, looked down upon, or felt dismissed as trivial? 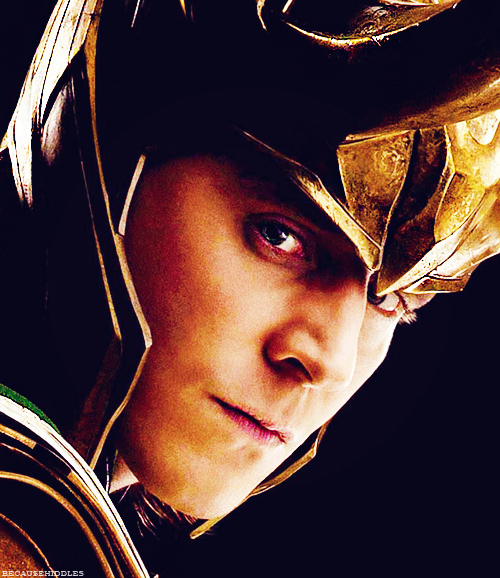 Then you might have a glimpse at the depth of what Loki was feeling as he confronted Odin. He has been unfairly mislabeled as a sociopath. By definition he is not. Only those who refuse to look passed his most overt actions are lead to think this. (For a full definition of sociopathy: http://www.mcafee.cc/Bin/sb.html) He is desperate to be loved and accepted. We all of us are and sometimes we do the opposite of what we know we should do just to get some attention-any attention. So why are we so enamored of this not-so gentle god? Why have so many joined his (unofficial) army? Because we all know that deep down inside we are all capable of doing and being just like Loki. It’s much more realistic than believing we could ever achieve the level of a super soldier, genius scientists or super spy. Loki is inspiring in other ways. He is a cautionary example to be certain, but he is also a character we can feel for, we can relate too and root for him to redeem himself and find happiness. We want Loki to find happiness and redemption because ultimately that is what we want in our own lives, to be loved and accepted for who we are. Excellent points. I am a member of Loki’s Army and say it proudly. My heart aches for him and the pain he is keeping inside of himself. I don’t think I’m going to be able to look at him without wanting to give him a hug or something. I really hope he gets his happy ending, even if he has yet to even reach it in the comics. Comics suffer from Ragnarok syndrome. Ending and repeating everything over and over. Though I share your sentiment. He would make a great anti-hero in his own graphic novel. I agree with you. I think the whole ‘diva’ thing, while not completely an act was definitely played up to great effect. He knows how to manipulate people at the most basic level even using just a look to solicit information or a reaction. I do love the interaction between him and Thor, reminds me so much of my siblings and I. Thor seems to be the only one that can really get to him. Your thoughts? He’s not an anti-hero, he’s an anti villain. He’s has some of the traits that heroes have, but in the end he’s still the bad guy. easy to confuse the two as they are both shades of grey, so to speak. Interesting observation. I see them as being basically the same thing since neither of them are truly heroic or villainous. One man’s hero is another man’s villain et al. Unfortunately there are no definitive definitions of either. The anti-hero can easily be the villain in the right story and the hero can also be the anti-villain. I think it’s all a matter of perspective. And perhaps motivation. I shall have to look into this more.